By Dennis McCarthy: Last night saw what promises to be the first of many fights, between great young guns James DeGale and his conqueror George ‘the Saint’ Groves. First of all, we hear a lot of bias towards fighters, especially on this site from certain writers, who, no matter how well a fighter (mostly British) performs, he “looks horrible” or “he would likely get destroyed if he was put in with this fighter, or this fighter”. In terms or DeGale and Groves, who have what, 20 fights between them, people tend to forget, or choose to ignore the fact that. Both fighters are kids, babies of the boxing world if you like, who have a hell of a lot of learning to do and have shown potential far beyond what they should be at the moment. 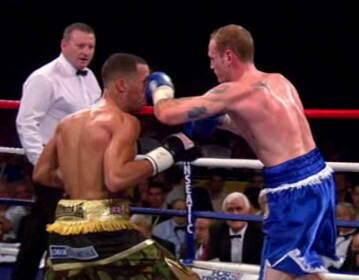 DeGale, in his 11th pro fight, was already making his first defence of his British Longsdale belt. The likes of Amir Khan, by their 11th fight, was only starting to move up to fight men, after having seen off the likes off puppies and drunken women in their previous bouts. We should concentrate on the fact that, we had a super show from two hungry young fighters, both with World class potential, happy to meet in the ring and put their ‘0’ on the line at such an early stage for the fans. In times when the best are refusing to fight the best, most notably Pacman and Mayweather, and sadly now it seems Bradley and Khan, these two have proved to be a breath of fresh air to the sport of boxing. I’m sure that both fighters will go on to much better things, they will grow, get stronger, get more ring wise and will be forces to be reckoned with. A rematch, and a few more rematches down the line are inevitable, and why not? As for the fight itself. I had the fight a draw, I don’t think either fighter did enough to “get one over the other”. The scores of 115-115, 115-114, 115-114 were as close as it got. If either fighter did nick the fight, I would have swung more in DeGale’s favour, but I think he was shocked in the early rounds at the fighter he was standing in front of, wasn’t the fighter who he’d sparred over 100 rounds with or trained to beat. I think a rematch would tell a completely different story, with DeGale gaining revenge. Expect less chat from him next time around though. Also a massive well done to Nathan Cleverly, who despite knowing extremely little about his opponent, dominated his bout comfortably.